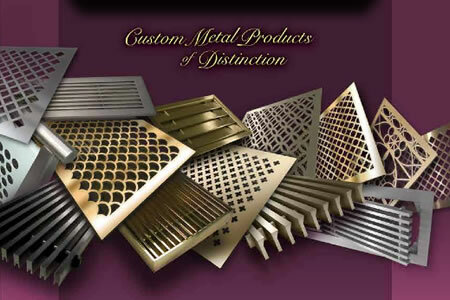 For more than a century, as a metal fabrication company, Coco Architectural Grilles & Metalcraft has perfected the art of custom metal fabrication. While honoring the time-proven techniques, our company also works with the most advanced technology available. As a result, we are able to cater to just about any customer need. Because of our extensive experience with unique projects, we are able to offer you virtually unrestricted metal fabrication options. If your design concept calls for a unique grille pattern, a laser cut wood perforated grille, or a bar grille with a radius to match a curved wall, Coco Architectural Grilles & Metalcraft is able to provide a solution for your specific project. Custom stainless steel products are also among our offerings. Stainless steel’s resistance to corrosion and staining, low maintenance and familiar lustre make it an ideal material for many applications, and if you design it we can fabricate it. Laser and Water Jet Cutting technology allows our expert metal crafters to tackle even the most intricate patterns or toughest metals including steel. It greatly enhances our versatility as we eliminate preconceived notions of what is possible in metal fabrication. Our finish options include, but are not limited to, antiqued, brushed, painted as well as satin and mirror finishes. Like the Linear Bar Grilles and Perforated Grilles offered by Coco Architectural Grilles & Metalcraft, our custom metal products are manufactured with the same benchmark standard of excellence and our undying commitment to total customer satisfaction. For inspiration, please see our catalogue options.